With this Smart HDTV, Smart Content provides new ways to explore and locate your favorite shows, movies, games, and more. A full web browser with WiFi built-in and innovative apps made for TV, along with Signature Services, enhances your enjoyment. AllShare Play allows you to stream content from other devices and enjoy it on the big screen. The Wide Color Enhancer Plus provides vibrant natural-looking images and it’s all in a sleek ultra slim design. 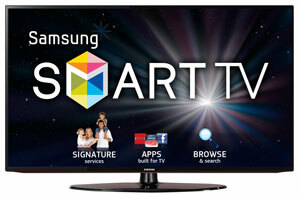 Never miss a moment with Samsung Smart TV. Watch your favorite movies while you browse the web or explore the Smart Hub. Find more content you love by searching for shows, movies, and videos across vudu, Hulu Plus, YouTube, and other digital content providers. Movies are handpicked for you through recommendations based on your viewing history and ratings. Access all your apps and download new ones such as Netflix, Facebook, YouTube, Hulu Plus, and Twitter! Browse the web while you watch movies and TV shows, and enjoy TV while you chat with friends and family online, all on one screen.